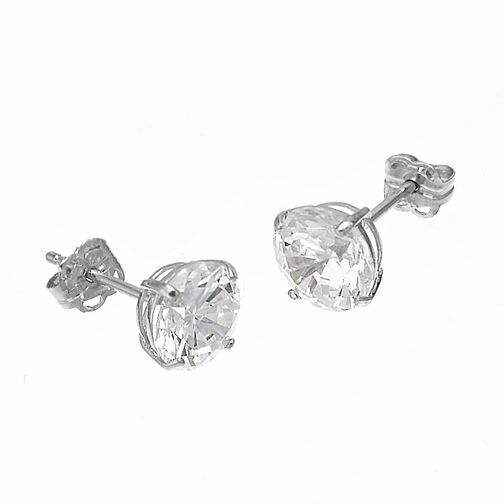 An elegant pair of 9ct white gold, 7mm claw stud earrings. An ideal gift for the woman in your life, even if that woman is you. 9ct White Gold Cubic Zirconia Round Claw Stud Earrings 7mm is rated 4.7 out of 5 by 3. Rated 5 out of 5 by Anonymous from Gift for Girlfriend I buy these exact earrings every year for part of my partners Christmas present and she loves them. I never realised the quality until they got delivered. The sparkle from them is unreal and she loves them so much. Only reason I get every year is she always loses one so more a replacement present but they would last if she didn’t lose them. Rated 5 out of 5 by Anonymous from Lovely earrings - perfect size These earrings are perfect for everyday and to dress up any outfit. They are the perfect size and are now my favourite earrings. Would definitely recommend.